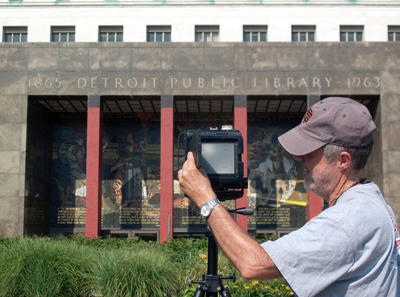 Dawson photographing at the Detroit Public Library, Detroit, Michigan. Willard Library in Evansville, Indiana, is said to be the only haunted public library in the United States. Standing in an isolated corner of the Victorian Gothic-style library in Evansville, Indiana, photographer Robert Dawson caught a glimpse of what looked like an elderly woman dressed in grey. 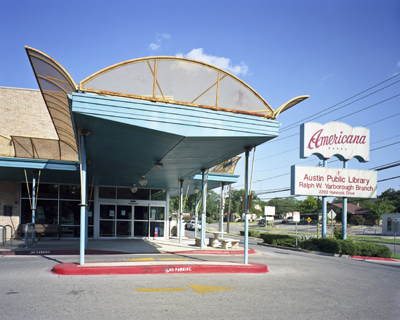 The shadowy vision sent a slight chill through Dawson, who was in the midst of a 21-year project that would eventually lead him to photograph 526 of the nation’s public libraries—a collection that, last year, was purchased in its entirety by the Library of Congress. “It was confusing and a little creepy all at once,” Dawson said of the encounter. That Dawson (Merrill ’72, psychology) would stumble across a ghost was not the only discovery in a project that would take him and his son, Walker Dawson, twice across the United States, covering 21,000 miles. In his travels, Dawson would find libraries big and small, humble and beautiful. He would see people arriving at these institutions to escape cold and heat, to learn to read, to catch up on news, to get access to a computer they could not afford. In short, he would discover a community’s heartbeat: its gathering spot, its historical repository, its intellectual hub, its social services center and, some say, an endangered part of American life. “The library is something we can all agree upon in our culture,” said the 65-year-old Dawson while sitting in his Noe Valley home in San Francisco. “It transcends ethnicity, class, and ideology.” In fact, he said, libraries are one thing that bring people together instead of pulling them apart. Dawson, who teaches photography at Stanford University, began his library mission after a series of collaborative environmental projects that resulted in books. A four-year examination of the San Joaquin Valley, for instance, became The Great Central Valley, California’s Heartland, published by the University of California Press. A book on water in the West titled Arid Waters was completed with his wife, Ellen Manchester. Other projects included a study of Mono Lake and Pyramid Lake. 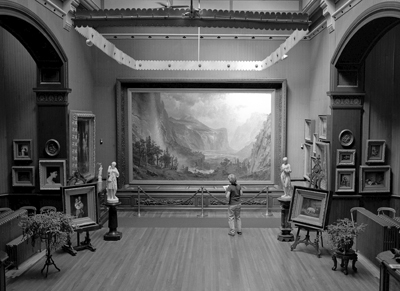 He decided public libraries would be his focus and began lugging his Toyo 4x5 view camera to capture images of facilities in the Bay Area, New Orleans, and Chicago. In 2009, he decided to make it a national project. By 2011, he and his then-21-year-old son were driving their old Toyota Camry across the country to document these institutions. They spent nine weeks on the road, covering 11,000 miles. The next year they ventured out again, adding 10,000 miles to the Toyota’s overworked odometer. In Death Valley, Dawson shot a single-wide trailer set under a flimsy shelter that served as a library for the park’s rangers. In Colonel Allensworth State Park in the San Joaquin Valley, he photographed the re-creation of a tiny library built by a handful of former slaves who’d come to the area to form a Utopian society in the early 1900s. In Monowi, Nebraska, a town with a population of one, he found a simple shed filled with 5,000 books. The books had belonged to the late husband of the town’s mayor and only resident, Elsie Eiler, who pays taxes to herself and grants herself a liquor license to run the tavern she owns. The library is named after her husband, Rudy. He shot Seattle’s striking glass and steel library designed by architects Rem Koolhaas and Joshua Prince-Ramus, and delighted in the New York library’s majestic reading room. He captured images of the Americana branch library, housed in a former nightclub in Austin, Texas, and arrived at the Rockaway Public Library after Superstorm Sandy to find residents charging cell phones, going online, and getting warm. “That says a lot about the place of a public library. It’s a whole part of community we tend not to think about,” Dawson said. At night, sweaty and drained from a day of shooting, Dawson would get himself a cold beer and close himself off in the bathroom of his motel to unload and load film by hand for the next day’s shoot. 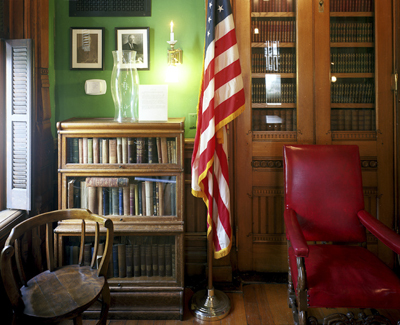 In 2014, Dawson published The Public Library, A Photographic Essay, with a forward by journalist Bill Moyers and essays by writers including Amy Tan, Barbara Kingsolver, Anne Lamott, and Dr. Seuss. Late last year, the Library of Congress acquired 681 of Dawson’s photographs, along with all his negatives, field notes, correspondence, and maps. Now, Dawson and his wife are undertaking a project to document literacy efforts in Stockton, which Time magazine called one of the five least literate cities in the country. Dawson also is seeking support for a global library project he will begin this summer by photographing libraries in Ukraine, Poland, Germany, Belgium, Holland, and France. For Dawson, projects like his library series have been a way to learn, to push his photographic skills, and to tell stories.